The Hundred (100s) is one of the most widely recognized exercises of the Pilates matwork and also one of the more choreographically complex. It is the first exercise in the matwork series in Joseph Pilates book Return to Life Through Contrology, and its expansive breathing and percussive pumping arms increases oxygen exchange circulating blood and energizing the body for the exercises to follow. The name comes from the hundred pumps achieved through 10 sets of 5 arm pumps during inhalation and 5 arm pumps on exhalation. Breaking down the components of the 100s into individual sections can help students more easily grasp each element as it integrates into the exercise as a whole. This awareness improves mental concentration yielding more fluid and precise movements. The key elements found in the 100s include quality of breath and its influence on core connection; sequence of abdominal muscle recruitment; and scapular stabilization to power the arms. I have had a few clients who initially expressed a dislike for this exercise, and later changed their minds after integrating the various parts into a more coordinated whole. The fundamental element in the 100s is breath, and costal (chest) breathing is necessary to perform the 100s effectively. During a normal breath the diaphragm contracts and descends to make more space available in the chest cavity for the lungs to fill and the belly expands. Although this diaphragmatic breath pattern is oxygen-rich, it is ineffective for the 100s since it does not provide adequate support for the lumbar spine when the legs are in the air. The abdominal muscles must be engaged during the inhalation phase of the breath cycle to counterbalance the weight of the legs. This abdominal cinching action reduces available expansion during inhalation to the chest cavity alone. If your client has only experienced diaphragmatic breathing, it may be difficult to maintain the engagement of the transversus abdominis on the inhalation and she may also feel that she does not get enough air with costal breathing alone. Therefore, proper activation of respiratory muscles must first be explored. Select the exercises most accessible and applicable to your client’s needs. Have your client lie supine and direct her to imagine she is lying in clay or sand. On the inhalation have her visualize that she squishes the ribcage down and wide making a perfect imprint. The breath should also open the sides of the ribcage so the thought of breathing through gills like a fish can also be useful. Breathe in through the nose for 4 counts and out through the mouth for 8 counts. Note that some people use their facilitating respiratory muscles to do the job of the primary respiratory muscles causing the shoulders to lift and lower during each breath. To prevent this, have her imagine that an inner tube is around the chest and to breathe only in this area. You can wrap a scarf around the ribcage for better feedback. Direct her to pull air through her nose and take as many “sniffing” breaths as possible filling up this inner tube and notice the feeling of the muscles engaging in the chest. The last few sniffs will not yield more air intake, but will feel more like intercostal muscles around the ribcage firing. After performing this sniffing breath a few times, go back to normal breathing and she should feel that it is easier to expand the chest and fill up the inner tube. Have your client imagine that she is breathing only through the right lung. Direct her to feel the breath in the back, front and side of the ribcage. Be sure she feels the expansion of the right ribcage through her focused attention. Then direct her attention to the left side. After feeling each side individually, have her feel the volume available when she breathes into both sides. This exercise demonstrates to your client that she controls muscle activation by thought and that greater attention can lead to an increased reaction. 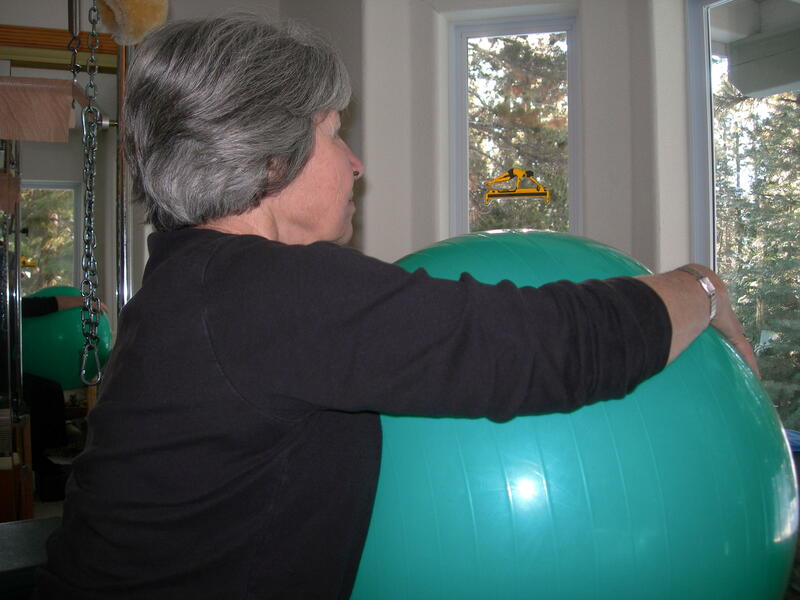 If your client lack s the proprioceptive awareness of chest expa nsion, it is helpful to sit next to a physioball and lean into it. The physioball gives better feedback as it “dents in” on the inhalation and “pops back” into the ribs on the exhalation. 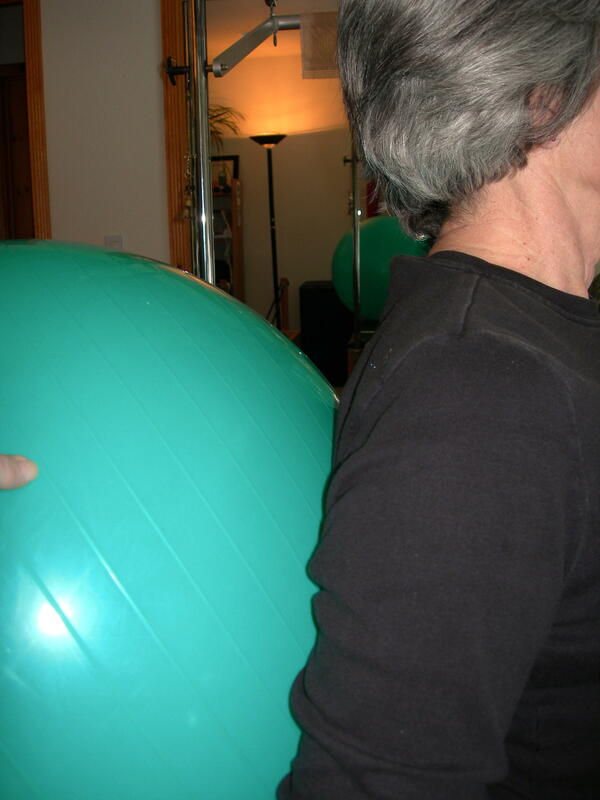 Assist your client to experience breath in the sideways, dorsal and ventral positions by holding the ball pressed toward her body as she breathes. Use a smaller ball than the one pictured if your client has shoulder issues and cannot raise the arm comfortably. Although a full breath in the chest includes breathing into the front of the chest, this can hinder lumbar support when lying supine and holding the legs in the air. When people breathe anteriorly, they often lift the chest off the floor diminishing the supported counter-leverage necessary to hold the legs in the air. Have your client visualize squeezing a marble below the xiphoid process and hold it on the exhalation with the narrowing of the ribs. Suggest that your client take an inhalation without losing the marble. This requires the breath go to the back and to the side of the ribs in a saddle shape. The marble image keeps the thoracic vertebrae pressed into the floor maintaining the strength of the posterior pelvic tilt and support for the lumbar region. The activation of the transversus abdominis or concept of “navel to spine” requires a cumulative response that evolves and deepens on each exhale. Clients will often tighten the abs in a bracing action as if waiting for a punch to the gut. This is a static engagement and works from the outside in. The transversus abdominis should initiate from the inside, as if the organs are inviting the abdominal wall inward. Guide your client to imagine the abdomen as an elevator. Keep the abdominals engaged holding the elevator level to let the people in on the inhalation (using a costal breath). As she exhales lower the elevator from the 3rd floor to the 2nd floor and feel the navel drop toward the spine in a relaxed action as if a soufflé were to sink in. Hold the elevator still on the next intake of air and exhale again to the 1st floor. The work phase takes place on the inhalation trying to prevent the belly from expanding and the relaxation occurs during the exhalation deepening the scoop. Any cumulative image will work. For example, deep sea diving going lower and looking at fish; scooping ice cream toward the bottom of the container, etc. The 100s breathing can be done in either a continuous regular breath or a segmented breath. The regular breath would include 5 arm pumps on the inhalation and 5 arm pumps during the exhalation. There is also an option to make the breath more percussive inhaling for 5 “sniffs” and exhaling for 5 “candle flickers.” The sniff should have a quality smelling something pleasant (not sniffing a nasal spray) and the blowing out the mouth should be like blowing a candle to watch it flicker, but not blow it out entirely. During the inhalation the ribcage should open and expand into the back with each sniff (as in the “Marble” exercise) and the belly should scoop and deepen during the exhalation (as in the “Elevator” exercise). This percussive breathing can contribute to the invigorating characteristic of the 100s preparing the body for further movement, but for some the saturation of too many details can cause confusion. Choose as needed. The posterior pelvic tilt or “flat back” position in the 100s occurs in an ordered sequence of abdominal muscle recruitment. If the pelvic tilt is taken in steps, instead of in one action, the low back can lengthen while the abdominals shorten in the front. In contrast, if the low back is pressed into the floor without first tractioning the lumbar vertebrae apart, it creates gripping tension and restricts the ability to scoop the navel toward the spine. My clients have expressed that this sequence gives them a deeper core connection. Take a costal breath expanding the ribcage and using the marble image outlined above, while holding the abdominal wall flat. Engage the pelvic floor at the same time as the transversus abdominis pulling the pubic bone toward the throat (sinking the soufflé as in the “Elevator” exercise). If your client has no experience with engaging the pelvic floor, the direction to stop gas and urination without squeezing the gluts can be helpful. This step happens on the beginning of the exhalation and should feel fairly relaxed. The pelvis will begin to shift into the posterior tilt, but only slightly. Direct the head and the tailbone to pull apart from each other to traction the lumbar vertebrae while the obliques bilaterally contract. This action takes place during the middle of the exhalation and should have a strong squeezing or cinching feel to shorten and contract the ribs toward the hipbones while lengthening the low back. The pelvis now moves into a full posterior pelvic tilt. Once the above is achieved the low back should have full contact with the floor and an imprint of the lumbar spine is explored. This step occurs at the end of the exhalation and a firm connection with the floor can be felt. Without releasing the pelvic tilt, begin the process over again until as deep a scoop as possible is achieved (see “Elevator” exercise above). 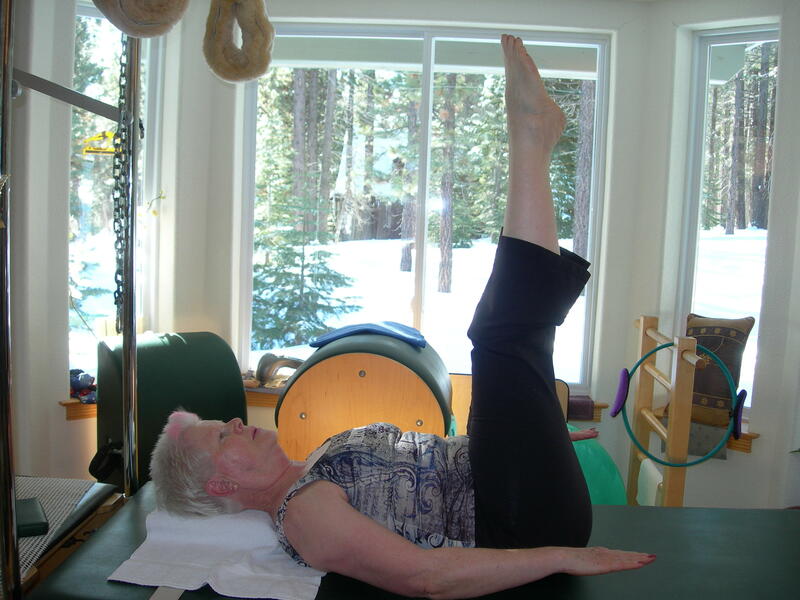 All Pilates exercises include initiation from the core prior to powering the limbs. The pumping arms in the 100s must start from the connection into the back, not the hands going up and down. Firing the lower trapezius, posterior rotator cuff and triceps will intensify the striking action of the arm pump. The arms should not feel like they are slapping, but rather they should be pressing isometrically against imagined thick space such as pressing into peanut butter in a rapid motion. Have your client lie supine vertically along a foam roller (or on the floor if you don’t have one). Raise the right h and in the air toward the ceiling and be sure your client feels the scapula either hugging the roller or on the floor and the humerus bone is weighted in the glenohumeral joint. 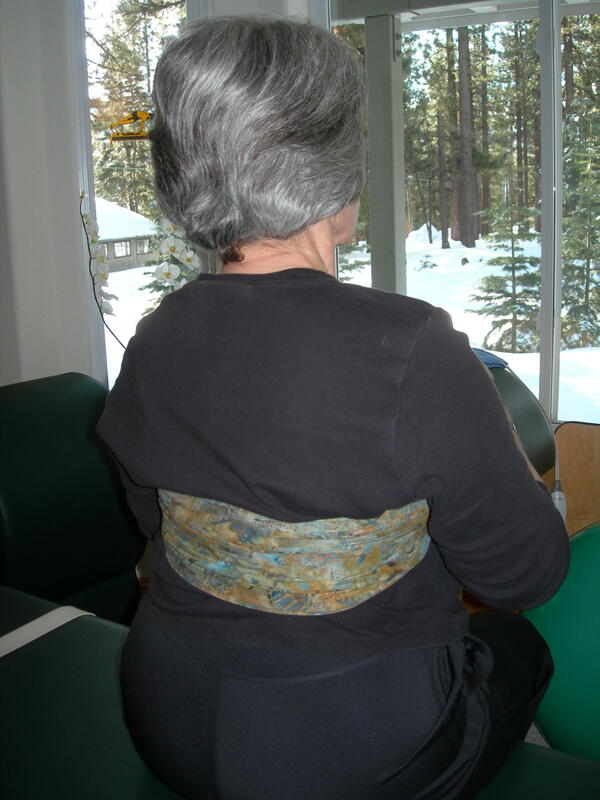 Elevate the scapula and squeeze the shoulder toward the ear staying connected with either the roller or floor. Lower the scapula to a neutral position relaxing the upper trapezius and then further depress the scapula with the intention of activating the lower trapezius. You may need to put your finger on the target so your client feels the inferior angle of the scapula pressing into you. Once your client feels the lower trapezius activate, have her hold the position and isometrically engage it further to increase awareness. Repeat on the left side and then do both at the same time. Have your client bend her elbows in front of her body to ninety degrees palms up as if holding a large tray. Stand behind your client and place the fingers of your left hand below the inferior angle of the right scapula and your right hand on her right shoulder with the thumb pressing into the infr aspinatus and teres minor muscles. Ask your client to externally rotate the right shoulder while holding the connection at the posterior rotator cuff and lower trapezius. The elbow has a slightly forward scooping feeling, and the ribs should not release. Repeat this exercise on the other side. After completing both sides ask your client to sit with her arms by her sides and hands on the thighs with the palms up. See if she can widen at the clavicles while pleasantly activating the posterior rotator cuff muscles without letting the ribs protrude. 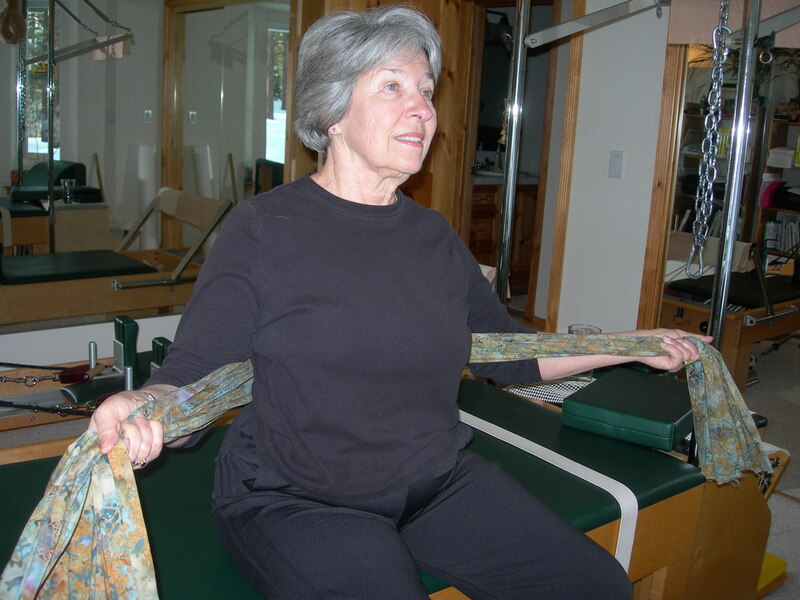 Another option is to have your client hold a scarf or piece of fabric around the mid-back doing the exact same exercise above so that the angle of the arm becomes clearer and provides a little resistance at the elbow. Performing the 100s in a prone position causes the triceps to go against gravity and activate more intensely. The depression of the scapula and firing of the posterior rotator cuff can also be felt more acutely in this position. Instead of pumping the arms toward the floor, your client will now be pumping the arms to the ceiling doing the exact same 100s exercise while lying prone and scooping the belly off the floor instead of imprinting into the floor. If your client does not experience neck problems, she can activate the back extensors to lift her head an inch or two off the floor keeping the gaze down to maintain the neck alignment. When the exercise is flipped back to the normal supine position, the client is able to feel a better core connection with an increase in isometric effort. Be sure to modify the 100s to accommodate your client’s needs. The entire 100s exercise can be done keeping the head on the floor. One or both feet can keep contact with the floor. Keep the feet on the floor or bend the knees in the air keeping them close to the chest. The palms can be flipped to face the ceiling on the pump to work more external rotation of the shoulder. The 100s can be performed standing alternating legs after fifty pumps or performed seated. If you want to chall enge your client, try the 100s while lying vertical on a half or full foam roller. Do the first half of the exercise with one leg in the air and then exchange legs for the second half. A BOSU can also be used to challenge your client’s skills performed in a supine position with the low back on the arc of the dome. The Hundred is a Pilates basic, but can be a coordination nightmare for some new students. Make it easier for your clients to integrate the components by breaking it down into simpler more digestible parts. As with any good building project, start with a solid foundation. Practice breath, abdominal acuity and scapular awareness to build a “power house” that is all about the core. Tibetan Singing Bowls are a great option for finishing a session with your client to leave her feeling centered, relaxed, and rewarded. These bowls from the Himalayan region are made from a combination of metals (bronze alloy, copper, tin, zinc, iron and sometimes other metals depending upon the age of the bowl) and produce vibrating tones when struck or circled along the circumference of the bowl’s rim with a mallet. They are used in yoga classes, holistic sound therapy, chakra re-balancing and personal meditation. Singing bowls produce a calming effect and reinforce the concept of living in the present moment. The pitch varies on the size and thickness of the bowl, and is played with a wooden stick that creates friction around the rim of the bowl like a wet finger would around a wineglass. The sound changes when using felt covered strikers on the side of the bowl giving it a lower tone. A less metallic sound is also possible using a suede covered mallet. Bowls come in small, medium and large sizes with and without decoration. It is easy to learn how to play them and requires only a quick demonstration on the technique of holding the mallet and how to apply pressure to the side of the bowl. When the bowls are placed on the chakras they allow the individual to hone in on the energy centers of the body. Although each note is linked to a chakra, relaxation and centering can occur whether or not this pattern is followed. When you buy a bowl, it should specify what notes are played with the striker and mallet. Starting at the 1stchakra the notes correspond in ascending order as C, D, E, F, G, A, and B at the 7thchakra. Although it is helpful to have an understanding of the chakra systems to direct one’s energy and attention, the balancing effect will take place regardless. I tend to place my Tibetan Singing Bowls on a client by size rather than the specific note rendered since the notes played blend together harmoniously. The calming vibration takes the mind from a cerebral analytical state to an emotional experiential state effectively diminishing internal mind chatter. For those “Type A” personalities, it is truly a gift to get out of one’s head and experience the state of “being-ness.” The opportunity to slow down and recover after a physical workout helps your client transition into the next activity of the day with relaxation and greater ability to focus. I have also used bowls to finish a group mat class with a guided meditation and have received positive feedback from students. I place the bowls in the center of the room and have the class lie on the floor on their mats like spokes on a wheel with their heads toward the center to clearly hear the sounds. I have even used my bowls in the hospital when my mother was recovering from a traumatic surgery (obviously not near the wound). Now when I go to visit her, she still asks me to bring them because she wants to repeat the relaxing experience. If there is time at the end of a session I will sometimes do what I call the “spa finish.” I have the client lie supine on the Cadillac with legs propped up on the short box from the Reformer if it is more comfortable. I heat a neck wrap in a microwave and place it around the client’s neck with a lavender eye-cover (ask if lavender is okay—not everyone likes it). I will sometimes cover the person with a heavy blanket to create a swaddling cocoon. I vary the placement of the bowls and how I play them depending on the emotional state of my client using my intuition as a guide. Striking a bowl under the table, one on the chest and playing another one above the body can create a tiered-effect. Occasionally wait for the vibration to stop before playing the next bowl. This silence can align the client with stillness and greater awareness of the present moment. Pilates is highly adaptable to all skill-levels, but should appropriately challenge your client physically and mentally. After providing your client with this stimulating movement experience, it is helpful to provide some kind of relaxing or centering ritual to finish. There are many ways to end a session, but Tibetan Singing Bowls just might leave your client singing your praises. Odds are good that if you are teaching Pilates you have heard of GYROTONIC® , but you might not be familiar with how it can expand and improve your perspective as a Pilates instructor. There are some people who tout the merits of each method as being the “be all, end all” movement experience. Personally, I tend to gravitate toward the philosophy that the more tools you have, the better equipped you are to assist your client’s needs. Even if you do not plan to get certified in GYROTONIC®, it is worthwhile to better understand what it is about and to try a session on your own body to judge for yourself. GYROTONIC® is the brilliant creation devised by Juliu Horvath utilizing three-dimensional movement with resistance. Although one of my friends affectionately refers to it as “gin and tonic” the name actually derives from “gyro” meaning a circle and “tonic” referring to something that is good for you. 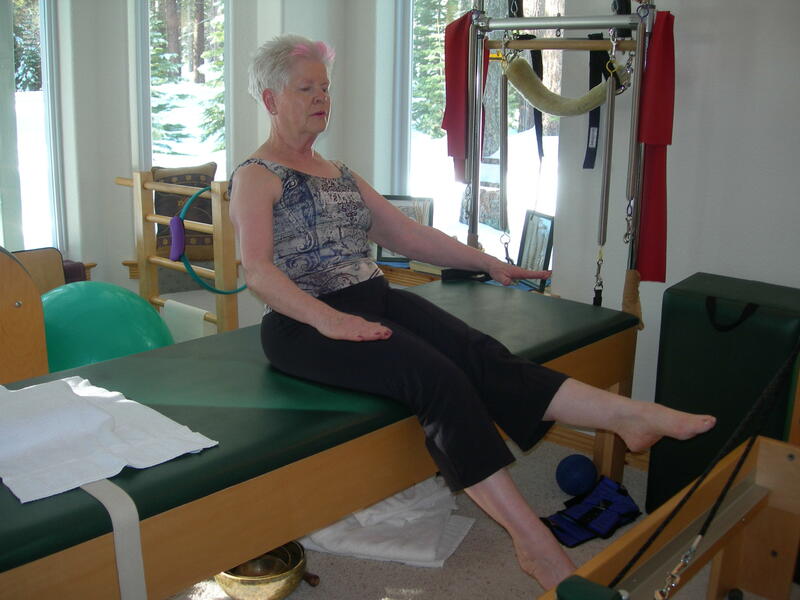 There are several pieces of equipment in the GYROTONIC EXPANSION SYSTEM®, but the most commonly used piece found in studios is The Pulley Tower. This apparatus consists of two handled wheels attached to a movable bench that sets next to a tower with a weight and pulley system with upper and lower resistance straps. The genius of this system is that it allows for freedom of movement in all planes in space, while calling upon strength with flexibility to perform the exercises with fluidity and attention to one’s breath. The joints of the body experience lengthened range of motion, and the exercises with handled wheels allow the spine to spiral with complex articulation. This type of spiraling is not practiced using typical push/pull gym equipment, and makes it an ideal exercise method for golfers hoping to improve their swing. The more extreme demand for shoulder mobility in some of the wheel exercises have allowed my clients with residual problems from shoulder surgeries or injuries to make remarkable improvements in their strength and flexibility. Over time, one of my clients who could barely open her arm laterally after completing physical therapy resumed full range of motion. In the hamstring series, the participant lies supine with legs supported in straps allowing for non-impact full range of hip motion. Several of my clients have commented on how much they enjoy the supported range of motion, and have been able to move from their hip joints without tension. The GYROTONIC® perspective observes how energy is directed in the body and physical holding patterns from past injuries can be identified (rather than the more placement-driven viewpoint of Pilates). Physical issues tend to reside where there is a break in the flow of energy, so being able to observe this is useful for honing in on areas of concern. Similar to Pilates, the exercises in GYROTONIC® initiate movement from the core, and then radiate the energy outward through the limbs. An ex-dancer client enjoys the rhythmic quality of the movement and says that the exercises can sometimes feel like dancing. 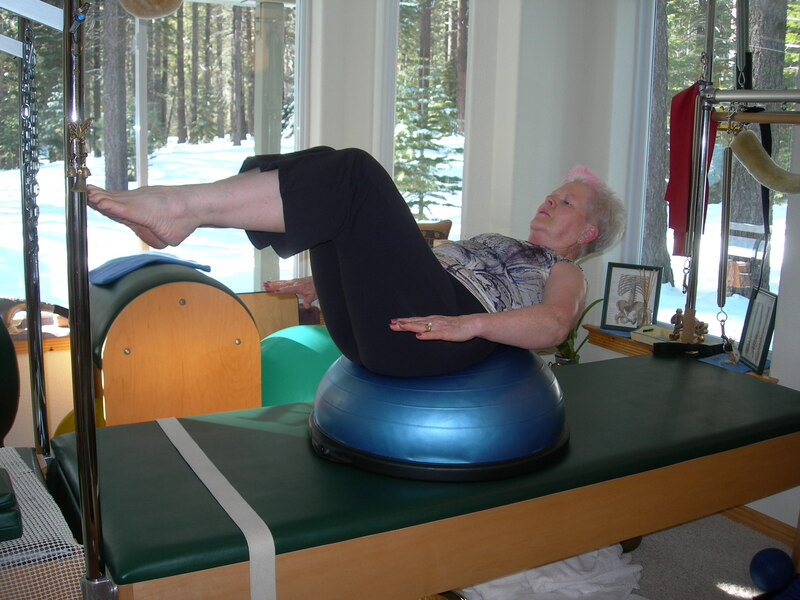 The principles found in the GYROTONIC® exercises can also be performed without equipment (similar to Pilates matwork) using Mr. Horvath’s method called GYROKINESIS®. 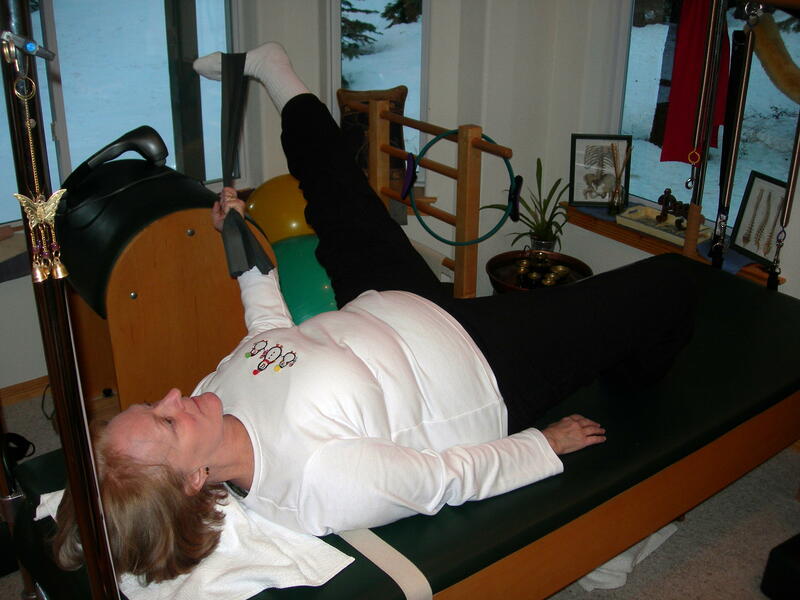 These specialized exercises are done sitting on a stool or lying on a mat and can be performed separately or complimentarily with GYROTONIC®. 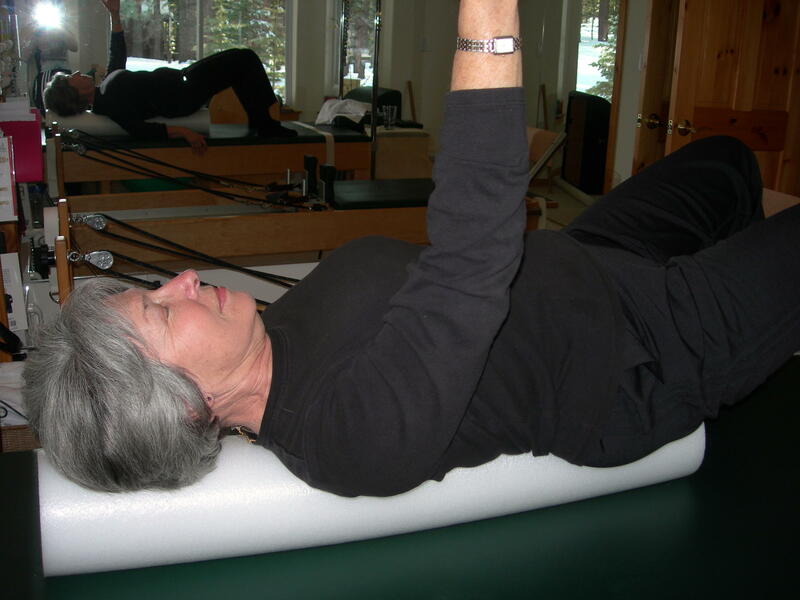 From my perspective, the similarities between GYROTONIC® and Pilates include core driven movement initiation, eccentric strength, attention to breath and its integration with exercises, and the importance of mental participation for body function. Exercises from both methods supply the necessary tools to address and correct dysfunctional compensatory injury patterns through non-impact exercise. Exercises are adaptable to all physical issues, skill levels and body types. My experience has found Pilates to be more user-friendly and better suited to introductory back injury rehabilitation, while GYROTONIC® mimics our more “real life” three-dimensional complex movement experiences. Pilates seeks balance in the body with bi-lateral development along the sagittal, transversal and coronal planes. GYROTONIC® explores how the body moves through these planes of space with maximum range. Even though Pilates is now a recognized mainstream exercise method, its widespread popularity did not occur when Jospeh Pilates was alive. 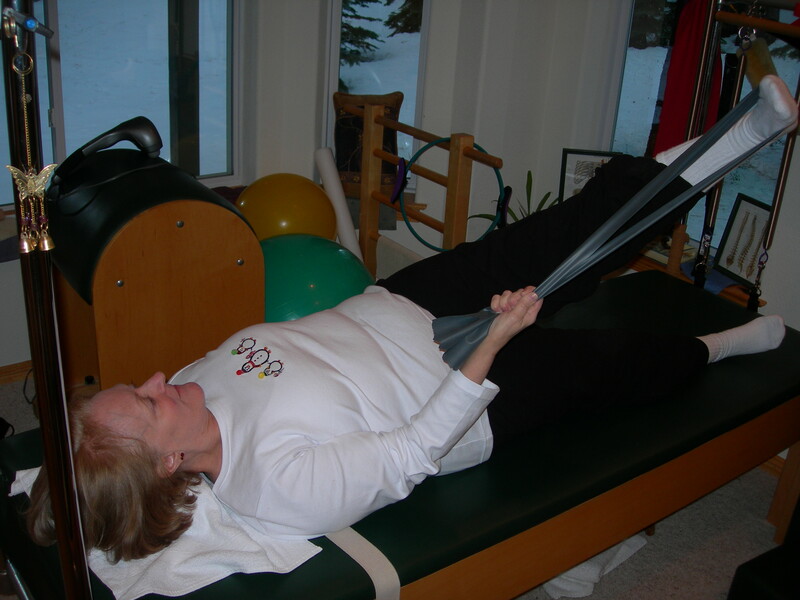 Currently GYROTONIC® is not as widely recognized as Pilates, but its versatility and functionality should catapult it into the public arena before long. GYROTONIC® is an “alive” method, constantly evolving and improving under the tutelage of its originator Juliu Horvath. Even if you do not plan to teach GYROTONIC®, studying with first generation teachers is a golden opportunity that should not be missed. It is common knowledge that stretching can help elongate muscles and reduce stiffness, but there are cases where stretching can actually worsen the situation and increase pain. Stretching a muscle that is already “knotted” and is pulled taut can further irritate it. It can be helpful to release the trigger point (knot) prior to stretching for ease of movement and better range of motion. Although you can refer your client to a massage therapist specializing in myofascial trigger point work, using trigger point release in a Pilates session can expedite improvement for immediate results. The pioneers of trigger point research, Janet G. Travell, M.D. and David G. Simmons, M.D., define a trigger point as “a highly irritable localized spot of exquisite tenderness in a nodule in a palpable taut band of muscle tissue.” Since we have multiple muscle fibers and these fibers are bundled together to serve a united purpose of joint movement, some of the fibers can remain in a contracted position without all being affected. Releasing the culprits causing irritation can allow the group to work better as a whole. The nodule is very tender to the touch and will elicit a response of discomfort and/or pain when touched depending upon its severity. The pain can be localized to the trigger point or referred to a seemingly unrelated location. An excellent user-friendly resource for studio or home use is The Trigger Point Therapy Workbook: Your Self-Treatment Guide for Pain Relief by Clair Davies. This manual takes you through the process of how to find and release the trigger point with diagrams depicting the areas of referred pain. If you want your client to consistently address trigger point release at home, it can be helpful to show your client a picture of the affected muscle and where the referred pain can be found. Although pressing your fingers into the affected spot can release the tightness, there are tools available that can make this process easier. A tennis ball, Thera Cane, Wooden Knobble, myofascial release balls or foam rollers can all be useful. Doing the work without equipment can improve your ability to find the trigger points by touch, but over time using tools can prevent excessive wear and tear on your hands. In addition, the tools encourage more consistent practice, because your clients are able to use them at home. Although it seems counterintuitive to press on a spot that provokes pain, the discomfort diminishes once the trigger point has been loosened. The muscle fibers are holding for a protective purpose, which may have been applicable during a situation of stress, excessive load or trauma. Once that situation has changed, the muscle sometimes needs an outside stimulus to break the loop. It is helpful to have an ongoing dialogue with your client during trigger point release. Since everyone has a different level of pain tolerance, it is worthwhile to have your client communicate with you throughout the process. Let your client know that the pain should register about a “7” on a scale of 1-10 with 10 being the most intense. As you press on the trigger point, you can have your client count you in “5, 6, 7” so you don’t push beyond the appropriate level of tolerance. If you press in the intensity of a 9 or 10, you will not have good results because the body will resist, and, if you do not press hard enough, there will be insufficient pressure for release to occur. You can also coach your client to inhale and tighten the muscle breathing into the pain and then relax the muscle during the exhalation. Instead of holding the trigger point consistently throughout, pushing on the trigger point on the inhalation and releasing pressure on the exhalation can at times make it easier for the client to let go. You know if the process is working when you continue to press with the same intensity and your client’s perception of the intensity decreases. It also gives the client a level of comfort to know that going INTO the discomfort has actually DECREASED the feeling of pain providing a positive experience. Trigger point release in a Pilates session is a means to an end. Your objective is to release the offending trigger points, so that the chosen exercise can be performed with greater ease and range of motion. If the work required is extensive, refer your client to a massage therapist trained in this method. Although it does take time to get the “feel” for trigger points, knowing how to release them can provide immediate benefits to your clients.